The Pens pulled off a solid win tonight against a Western contender. Fleury was on all night showing the fans from Alberta just why he'll be between the pipes for their country in February. Stopping 37 of 38 shots and standing on his head a few times he rightly deserved the first star honors and FSN's player of the game. Just once I'd like to see him waive the finger like Mutombo after a killer save. He had one against Dawes where he looked real composed on. To be honest the game started off looking like an AHL match up in my opinion with a slow start for each team. You got the impression they spent some time feeling each other out since they play each other but once a year, unless they meet in the Stanley Cup. Afterward it got real intense and there were shots and hits galore. We saw a Goddard fight that was so so. But even with Calgary being a team known for its physical presence, the Pens out hit them and I believe won the many of the physical battles along the boards. Borrowing the statistical comparison from ESPN.com you can see the game was quite even for the most part, save the total shots. That's just what the game ended up feeling like. Both teams ended up having their chances particularly on the power play. But ultimately it came down to goals from Crosby getting his 30th, Guerin tipping in a Gonchar bomb, and a late one from Kennedy. Calgary's only goal came from Mark Giodorno who capitalized after a slew of shots and a good power play sequence from the Flames that left the Pens tired. POWER PLAY: Pens power play finally showed a different look. Interesting they made the attempt against a team that would normally not be accustomed to the normalcy of the Pens power play, but in any event it works. Players moved around and Sid moved from the front of the net to the point, all over. I tend to agree that when you have a guy like Crosby as smart as he is you can let him roam around and create something. Keep him in one place and the PK has an easier time to defend and contain. GOALTENDING: I'm convinced Fleury is at his best when he's under pressure. Recently he's been pulled for letting a bunch of soff goals through. One the other night against the Wild (their first goal) that looked like an error on a third baseman. Can't let that happen. Well he didn't tonight. He was as on as we've ever seen him and the game ended up in our favor as a result. GENO: Malkin played much better hockey despite not getting on the score sheet. He attacked the net and charged through the neutral zone with confidence. He even drew a nice penalty toward the end of the second just by going to the net. Much like basketball, if you go to the net (hoop) you're not only more likely to score, but also more likely to draw a penalty (fowl). As such, there you go. After he gets his first goal he'll be fine and we'll all forget about this like we have all the injuries.Talbot being on his line seemed to have more of an impact on Max than Geno. And sweet new commercial Max. DEFENSE: Much better overall. Guys were in position and making crisper, smarter passes. Gonchar being out there is such a big difference. Crosby's goal was unreal. He split two Calgary defenders, one being Bouwmeester, who Crosby seems to thrive off of, and changes direction at the end to create a way for the puck to find its way behind Kiprusoff. 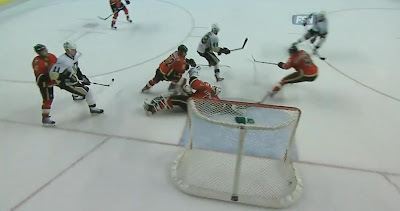 Here is Guerin's goal which was originally credited to Goligoski. I pointed this out before they changed it and had to show exactly where Gogo was after the shot was taken. 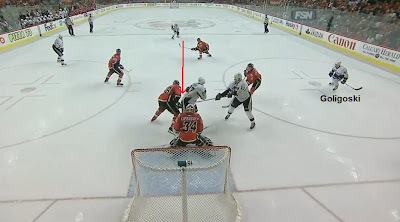 Crosby seemed to have more to do with the redirection because the shot was low and you can see Guerin's stick was high. 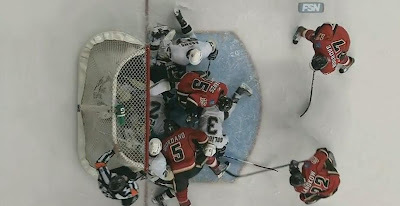 This is just an example of what Fleury had to deal with. Count the guys in the net, I see 7. This is how hard Calgary was trying to get the puck past the Flower as they were pushing and shoving up front to get that red light to come on. One good thing about this pic is where the defense was. Notice McKee on the ice behind Fleury and Gogo on the ice in front of Fleury. That's defense. Finally we have TK's goal at the 18:20 mark. A play that was completely created by Staal to redeem Fedotenko for getting a breakaway and hitting the post, Kennedy had enough patience to wait out Kiprusoff's flop and put it behind him.